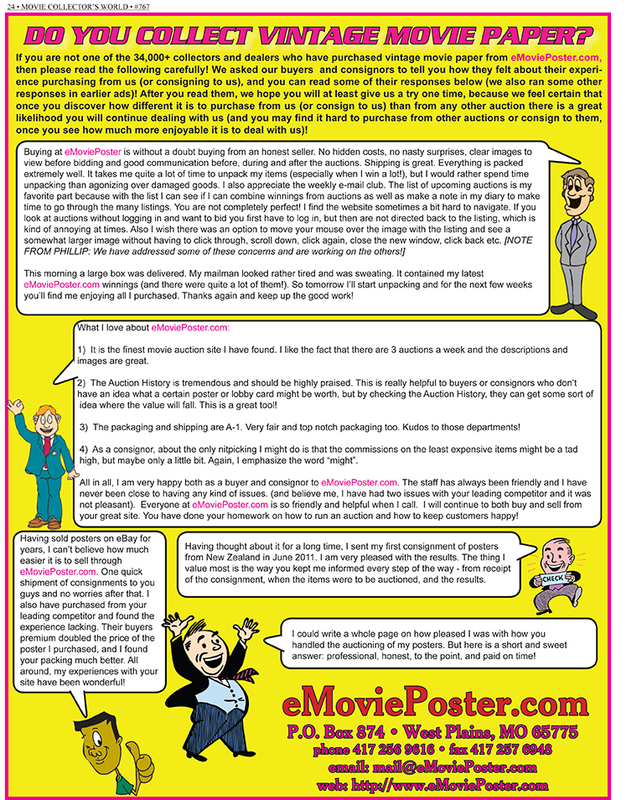 Learn all about consigning to eMoviePoster.com auctions here! If you are ready to consign, when you send us your items, be sure to include the Consignor Reference Sheet (click HERE to print it). And only send your package AFTER you have read the below info which covers most questions! Have "better" items to consign to our major auctions? We do four to five of them each year! Go HERE for details about upcoming major auctions and the deadline to consign to them. The only work you do is getting your items safely to us. We do everything else! No hidden commissions or fees, and no "fine print". We stand by what we say and will never mislead you. We NEVER buy items from you (as almost every other auction house does) because that would put us in direct conflict with our consignment based business, and we would be on "the opposite side" from you, needing to buy your items for a low price. When you consign to us, we are "on the same side" so if your items sell for more, then you get more and we also get more. This means we are highly motivated to get the most for your items. 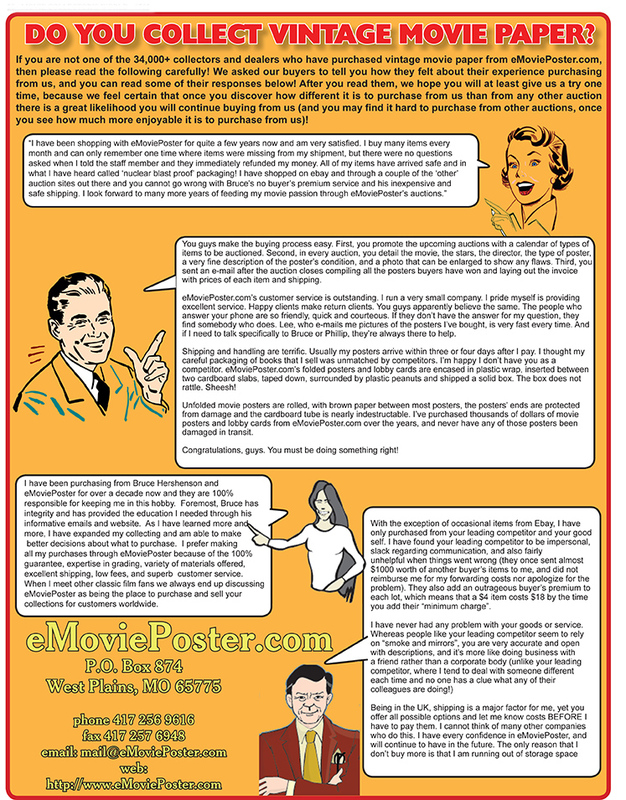 You get an audience of 47,000+ movie paper collectors who know us (many have been buying from us for 28 years) and who know that we always describe everything honestly and usually send purchases out within a few business days of receiving payment, very securely wrapped in custom made extra-strong boxes and tubes. This makes bidders more likely to bid on an item we're offering than one offered by someone unknown to them (like you!). Since we auction on a regular schedule every Tuesday, Thursday, and Sunday offering 2,000 to 3,000 items every week, bidders are more inclined to look over our auctions because we will probably have something to interest them. There are thousands of people who check our auctions every single time, and who would probably miss your item if it is auctioned any other way, because they simply don't have the time to check out other auction sites on a regular basis! Your items need to have a realistic retail value of at least $15 per item (you can check this in our searchable Auction History) OR you need to be willing to let us auction sub-$15 items in bulk lots. Tightly rolled posters need to be "flattened" under weight for 2 to 3 months before we can auction them. If you send any, it will take at least this time for them to reach auction, so don't send them unless you have that time! You need to be willing to send them to us and trust us with them (but know that we have done nothing but auction movie posters for the past 28 years, and that we have a 35,000 square foot warehouse, and we are not going anywhere!). You need to let us sell them with NO minimum bid for each item, and accept the possibility that you may receive less for some items than you thought they were worth. However, you will surely receive far more than any dealer would offer you for those items (and we charge lower commissions at every price level than any other major auction, and we have no "buyers premiums"). Overall, you need to trust us with your material during the time we have it, and trust that we will honestly report how much each item sold for (although, since they will have sold on our auction site, you will be able to "follow along" and verify what we say). If you have any doubt about your willingness to trust us, stop reading now! We can say that we have paid out well over 86 million dollars to over 2,100 people just like yourself, and we have had only a few dissatisfied consignors (who had unrealistic expectations, or who did not read our simple terms outlined here), a record we are very proud of! Now of course the above cartoon is an exaggeration, but not by as much as you might imagine! Several trucks (some driven by our employees and some by our consignors) have pulled into our warehouse FILLED with entire collections from dealers and collectors who had decided to consign everything they had to us. We usually have a truck arrive every month or two, and we actually had a few times when two different trucks arrived on the same day! Now we are the ONLY movie poster auction there is where this is not that remarkable, and, because we own an entire city block, we can easily accommodate even these kinds of massive collections. And of course most days we receive ten or twenty packages sent to us by some of our over 2,100 consignors, and those don't pose a problem either! We have carefully figured out how much time and effort goes into selling an item online, from start to finish. It takes the exact same amount of work to sell a $10 one-sheet as a $1000 one-sheet. The cost to us of the labor and overhead required to sell each item is an absolute minimum of $9 each. The vast majority of buyers pay with credit cards or PayPal, which costs us roughly three percent of the total. Taking everything into consideration, we have arrived at the below commission rates. *The rates are for each individual item sold, not for your consignment as a whole. Also, a "bulk lot" is considered a single item, so if a lot of 50 posters sells for $100, the rate you pay will be 28% for one item, not 75% for each individual item. IMPORTANT NOTE ABOUT OUR RATES: If you compare the above rates to those of other major auction companies, it may appear that we charge MORE than they do. BUT ACTUALLY, WE CHARGE LESS THAN THEY DO AT EVERY SINGLE PRICE LEVEL! How is this true? Because they charge "buyers premiums" to every buyer (usually 20% or so), which means that a buyer of a "$1,000" poster pays $200 more, or $1,200 in all. The seller (you) then receives $1,000 less their commission (usually 15% to 25%), which means that you receive between $750 and $850 on that poster that the buyer paid $1,200 for. But IN OUR AUCTIONS, when your poster auctions for $1,200, there is no buyers premium, and you receive $1,200 less 20%, which is $960, substantially more than the $750 to $850 you receive from any other major auction! Note that we almost always lose money on the sub-$20 items, because, between labor (where we have between 10 minutes and an hour of labor in every auction, depending on how many items it contains), and we don't get enough to pay for that time for items that sell for under $20, because in addition to our labor cost, we still have to pay all the web hosting fees, advertising fees, and credit card fees (we'll get $4.50 for an item that sells for $6, but we still lose money on that item! We get $7.20 for an item that sells for $12, but we still lose money on that item! We get $10 for an item that sells for $20, and we probably just barely break even on that item, which is a waste of our time!) Therefore, we have made these rates extremely high on the sub-$20 items in an attempt to get people to stop sending them for individual sale (but while we gladly accept such items as "bulk lots", you still have to use common sense; don't send us 100 newer posters in terrible condition, because no one will want them at any price, even $1)! Sub-$20 items COST us money (we lose money on almost every one) and they cost our consignors money, because having a lot of sub-$20 items causes bidders to lose interest in bidding, and they bid less than they do when there are very few sub-$20 items! Remember that we must pay all the website fees, the credit card fees, and the cost of sending the items, and, unlike every other major auction company, WE CHARGE NO BUYERS PREMIUMS TO OUR CUSTOMERS! Please realize that if you were to sell these lower priced items yourself, you would probably find that you weren't even earning minimum wage, after taking into account the amount of time you spent and the fees you would pay. Selling items for just a few dollars each is just a waste of everyone's time. We are looking for individuals who have items that have a minimum realistic value of at least $15 per item (or who are willing to let us group less valuable items into "bulk lots"), and will trust us to be 100% honest with them. Since 1989, Bruce Hershenson has organized 19 major movie poster auctions (10 for Christie's auction house, 3 for Howard Lowery auction house, and 6 mega-auctions held on eBay on specific days in 2001-2004) with total sales of over 10 million dollars! Between 1989 and 1999 he sold over 30,000 vintage movie posters and lobby cards through sales catalogs with sales of over 4 million dollars. 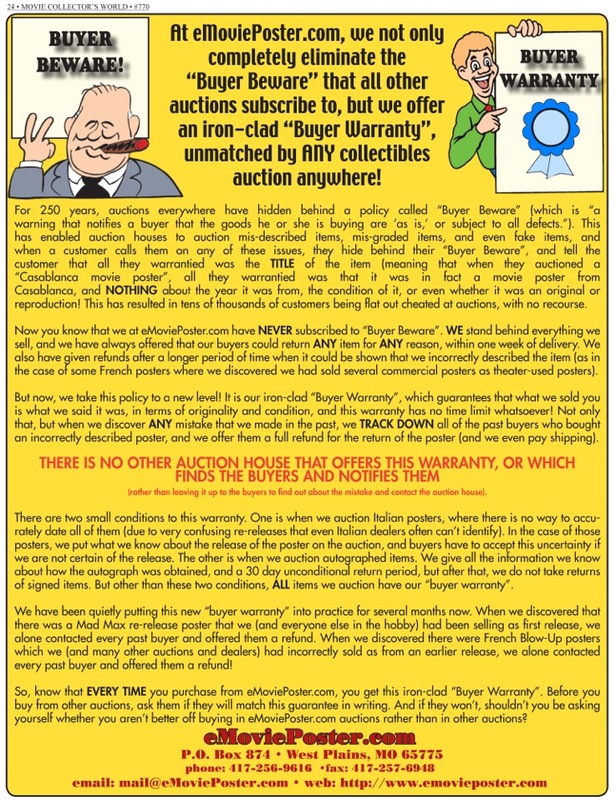 In 2000, Bruce switched to auctioning solely on the Internet and between 2000 and 2008 sold around 300,000 items on the eBay auction site, and since 2008 has sold nearly a million items on his own auction site, eMoviePoster.com, with total sales of $67,490,135 (averaging $5 million a year from 2013 to present!). Bruce has also published 42 full-color movie poster books that have combined sales of over 300,000 copies! Having seen how many auction houses operate first hand, Bruce Hershenson started eMoviePoster.com with the philosophy that auctions should be run with honesty and integrity both with our bidders AND with our consignors. If you've never dealt with us before, once you do, you will quickly find that everything we say is true! 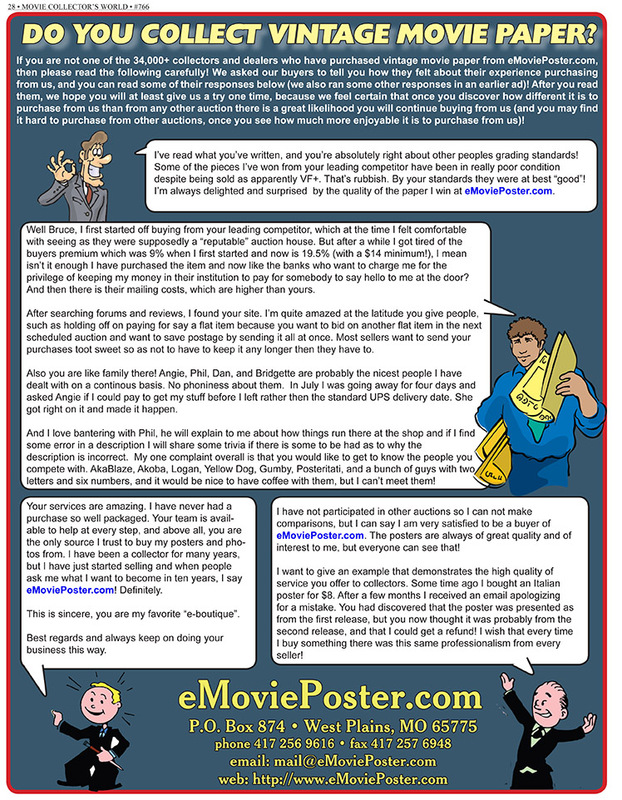 Q: What if you have posters that are only worth a few dollars each (either solely such posters, or in addition to "better" posters), and you simply want to get rid of them? A: We can create "bulk lots" of your "lesser" items and auction them for you that way. You won't get that much money for the posters, but you will get more than you could selling them any other way, and there is no effort on your part. Plus, let's say we sold 100 items for you for $1 each individually. You would receive $25 after our commissions. However, if they are sold as a "lot of 100" items and still sell for $100, then you would receive $72 due to the far better commission rate. Note that you still have to use common sense; don't send us 100 newer posters in terrible condition, because no one will want them at any price, even $1. UPDATE 12/10/2018: We are trying to stop auctioning items with almost no value, even in bulk lots. If consignors send items that are virtually worthless, we will either return them to the consignors at their expense, or more reasonably, throw them out. Please click to Learn More. Q: How long will it take to get your items sold? A: We run a cycle of auctions every 2 to 3 months based on what has been consigned to us. This means that some items (such as folded one-sheets) will be auctioned relatively quickly while others may take several months to auction. In addition, posters that are not "standard" sizes (such as banners, special sizes, non-movie posters, sheet music, etc) will only be auctioned one to a few times a year. In addition, tightly rolled posters need to be "flattened" under weight for 2 to 3 months before we can auction them. If you send any, it will take at least this time for them to reach auction, so don't send them unless you have that time! THEREFORE, PLEASE DO NOT SEND THESE TYPES OF ITEMS UNLESS YOU CAN ACCEPT THAT IT MAY TAKE US 6 MONTHS, A YEAR, OR MORE TO AUCTION THEM. But we really do auction 95% of what we are sent within a few months! It is the "oddball" items (or tightly rolled posters which need to flatten) that take a very long time to get auctioned. Q: When will you be paid? A: We always pay at the end of the month following the month in which items are sold. For example, if your items sell in July, we will pay you at the end of August. Why is this? After the auctions close, it can take several weeks to collect payment from all the buyers. Once the items have been shipped, we need a couple more weeks to be sure the buyers are pleased with their purchases and will not be returning any (but know that returns happen less than 1% of the time). Given our payment schedule, we will be paying you between 30 and 59 days from the time your auctions close. In the event that an item hasn't been paid for yet, we will list it on your payment statement as "Payment Pending or to be Relisted". If it is paid for, it will appear on a future statement. If it isn't, we will block the bidder who didn't pay (so he/she can't do it again), and we will re-auction the item. Also, know that if your payment is less than $20, we will hold it until it totals more than $20 which saves you and us both time. Of course, you can request us to make the payment anyway by contacting us. Q: What will your payment statement show? A: It will have a detailed accounting of every single item we sold for you in that month, what it sold for, when it sold, and what our commission was. The end of the statement shows a summary of what you received and what we received for our commissions. Q: What can you expect once you've sent your items to us? We will notify you via e-mail when your consignments arrive (it may take a few days as we often receive dozens to hundreds of packages a week). We will begin preparing them for auction soon thereafter. NOTE: They will likely be auctioned when we next sell those sizes, UNLESS it is one of the items that we have one or more examples of the exact same item already consigned to us. We will notify you via e-mail when items of yours are put up for auction. One week later, we will notify you via e-mail of the results of your items. On the last day of the month after the month in which your items sold, we will pay you by check sent by U.S. mail (unless you have made other arrangements such as payment by PayPal or bank wire). Q: What if you're not 100% certain that you want to send your items? A: We do not want you to send your items if you do not trust us. But of course, you can start by sending a sample group of 20 or so items to see how they do, and then decide from there how you feel about our service. We are 100% sure that we will get you far more money for your items than you would get by selling them to any dealer, or consigning them to any other auction company, and if you sell them yourself, you will AT BEST get around what you would have gotten from us after our commissions, but you will have done a LOT of work! Q: How should you pack your items? A: Be sure to pack your items securely and in sturdy packages! We are very sad when we see consignments that got damaged in transit to us due to poor packing. Always be sure items do not "shift" within your package when you shake it strongly. You can be sure that the packages you send to us will be treated far rougher by USPS, UPS, FedEx, and DHL. Here are some visual examples. Additionally, we've created a "Secure Packaging Guide" to help you pack your consignments in a more sturdy way. Q: Should you send "framed" posters? NO!! A: Whenever people have shipped us posters that are framed, the frames often arrive broken which usually results in damage to the poster. Therefore, we ask that you NEVER send a framed poster through the mail. Instead, remove the poster from the frame and send the poster by itself. Additionally, we don't sell or return the frames, so there is no benefit to sending the frame to us. Q: Can you use your consignment proceeds to pay for purchases? Yes! A: A LOT of our consignors do this, and it is absolutely fine to do (and it can save you and us both money on credit card transaction fees!). If you want to do this, just e-mail us (or reply to your winning bid emails) and we will do it. You can also select this payment preference when you fill out your Consignor Reference Sheet. You can learn more here. Q: Is it OK for consignors to bid on their own items for any reason (like because they are currently selling for a very low price with just a short time to go)? A: Absolutely "NO" under any circumstances. These are NO RESERVE auctions, and consignors are not allowed to bid on their own items. If we discover that you bid on your own items, we will return your consignments to you and no longer accept future consignments. You have to be able to accept the "no reserve" aspect of our auctions, or you can't consign. While the vast majority of items end up selling for between half of a reasonable retail and twice a reasonable retail, there are always a few items that sell for far under what you would expect they would, and if you can't live with that uncertainty, then you can't consign to us. Q: Do I need to send eMoviePoster.com a list? Nope! A list is solely for your benefit. Once the items arrive here, we enter them into our system in our own way, and don't refer to those lists at all. So you can save a great deal of time if you do not make such a list, but of course, it is entirely up to you whether you do. That being said, if you already have a list, you are welcome to include it. Q: What if you have more questions? A: We are happy to answer any questions you may have. You may e-mail us or call us at 417-256-9616 Monday to Friday 8:30 AM CST to 5 PM CST (but not 12 to 1 CST when we take lunch) to discuss your consignments. Review the "Questions and Answers" section, especially "What can you expect once you've sent your items to us? ", above if you haven't already. TIME-SAVING IDEA! Print out the "Consignor Reference Sheet", fill it out, and include it inside your package. This short form makes processing of your consignments much faster for us. This insures that we have all the information we need. 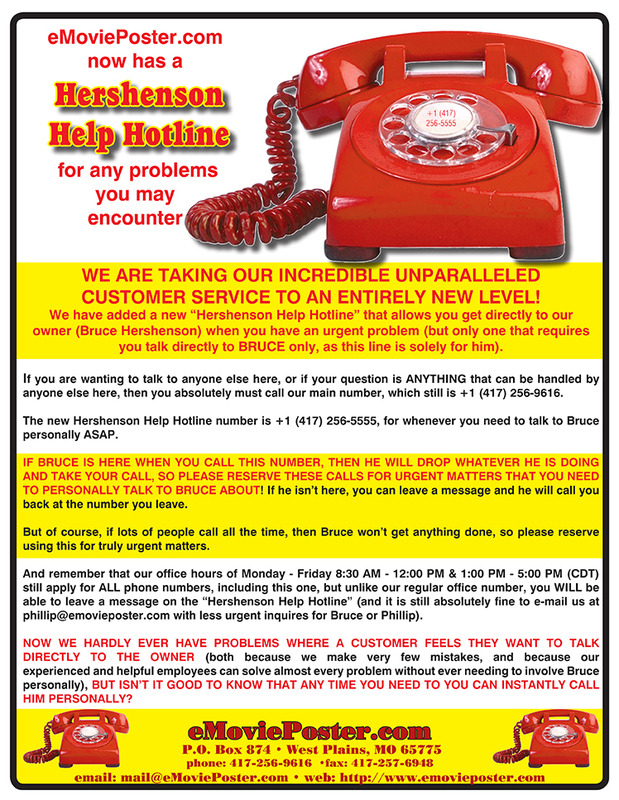 Our hours of operation are Monday through Friday from 8:30 AM to 12:00 PM and 1:00 PM to 5:00 PM (Central Standard Time). We are closed from 12 to 1 for lunch. WHEN SENDING CONSIGNMENTS, PLEASE BE SURE TO INCLUDE THE CONSIGNOR REFERENCE SHEET WHICH ASKS FOR: your name, phone number, mailing address, e-mail address, and consignment preferences.